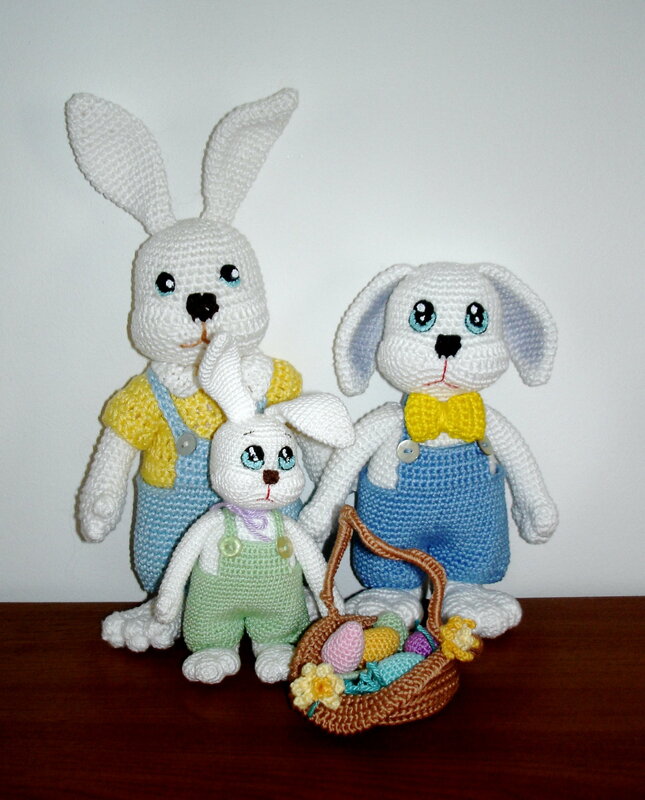 As you can see it is pretty much the modern Bunny family; grandparents, mom and dad an one child (in tis case son). On the next photo are young mom and dad with their son. The pattern you are going to have is for this kind of bunny. I have written down as many details as I could. 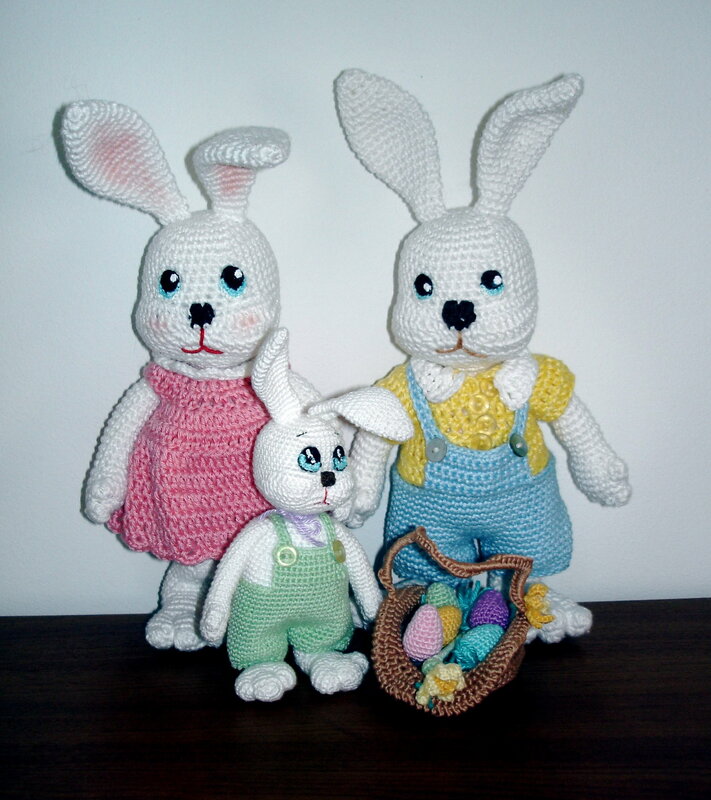 Eyes are crocheted as well, and you will find instructions on how to make them as well. Here the ladies decided to take photo alone…the little one jumped in last second. For any questions regarding the pattern, please feel free to contact me. 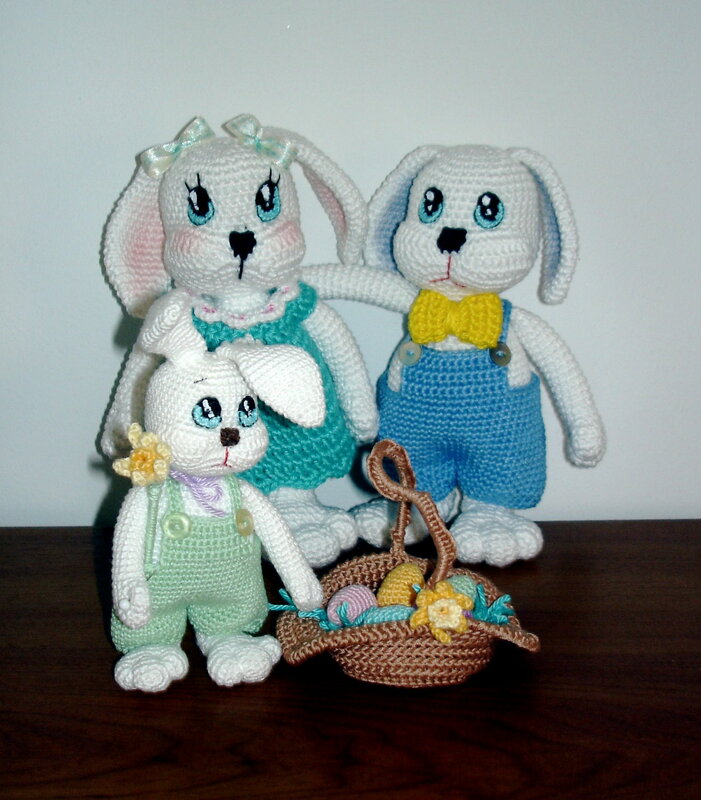 I really hope you will make a bunny or two and don’t forget to send photos for our family album! Thank you very very much for these. R12 Turn work and sc9 ,…. Plz help me dear Vanja. Not sure what you don’t understand with moving stitch marker one stitch forward. Simply crochet one more stitch and make it you start of the round. By this time we have worked in rounds. After moving stitch marker we are moving, from rounds to work in rows. so no more working in spiral, but finish the round, turn back to start new one. In ordinary way, when working in rounds, and with single crochet, after finishing round, you’d ch1, and turn. This ch1 helps you uplift the stitch and ables you to work in last stitch of preious round. Without making this chain you would not be able to stitch the first stitch. That is when we want to stitch straight and make rows even. This time we do not want rows even but want to decrease. Decrease will be done by not making this ch1 at the end of each round. This way we will skip the first stitch and this way we will decrease one st on the beginning.